We spend five hours on the roof of a train with a beautiful view to the Andean landscape (along with about 200 other gringos who, like us, had gone to Riobamba only because of the famous train ride…). Along the track we were greeted by numerous farmers and kids, primarily Indians. It was a good feeling to see the enthusiasm of the locals towards us. 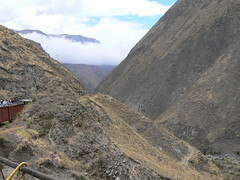 It was a great feeling to pass the enormous heights of the Andes. From Alausi we went to Cuenca. Cuenca has a reputation of being the most beautiful city in Ecuador. We are convinced! The city has a great historical centre, and lots of nice squares, where music is being played to create a nice calm environment – a great spot to observe the local life. The colonial architecture of the buildings and the 80 churches in Cuenca actually makes you feel like being in the southern part of Europe. It is a very clean and inviting city. We did not do much – except for lots of wandering in the historical centre in great sunny weather, which was a good contrast to the cold hours on the roof top of the train ride, and we really enjoyed being in a place with a great variety of food like Columbian pancakes and Mexican tacos, in contrast to the more common chicken and rice. For sure we have enjoyed our time in Cuenca! Cuenca is also known for the so-called “Panama hats”, at least this is the name for the hats in Europe and the States, but you will offend any Ecuadorian if you used that name. The “Panama hats” are Ecuadorian and has only been named Panama hats because of all the Ecuadorian labour that went to Panama about 100 years ago to help the construction of the canal, where the hat became famous. Thinking about the weeks it takes to make the hats, which are made of a special palm that only can be found on the north-western coastline of Ecuador, makes it a special souvenir. Tomorrow, we will head for Guayaquil and continue on to the Galapagos Islands. Hopefully we will find a boat there, which can bring us on a trip around the islands. Barbara please take a picture of Henrik with his Panama Hat (Equador). The animal name is LLAMA in insted of Lama OK ?